PHUKET: Dangerous rip currents at Phuket beaches have seen tourists along the west coast needing rescuing this week, with two tourists needing rescuing at two different beaches on Tuesday alone. One tourist was rescued at Kata Beach on Tuesday (July 3), with the rescue being recorded on video by a bystander who plainly said that he had heard lifeguards tell tourists along the beach many times that it was too dangerous to enter the water. Regardless, at least one tourist ignored the warning and was quickly pulled away from the beach by a rip current. 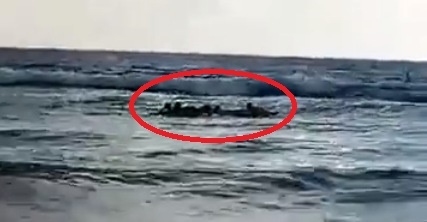 The video, posted online by “Tu Vinai” (click here), shows the tourist being brought back to the beach through the strong waves that were breaking on the shore. It was later reported that the tourist made a full recovery. Suppachai Chanpetch, Head of Karon Municipality Tourist Assistance Centre, told The Phuket News that such rescues were becoming a daily occurrence. “I have yet to receive an official report from the lifeguards of the rescue [on Tuesday], but I have seen video already. This is normal, it happens almost every day,” he said. “Some tourists do not obey the lifeguards’ warning. We need tourists to follow the warnings given by the lifeguards, especially because some of them may not be so lucky to survive,” Mr Suppachai said. Later Tuesday afternoon, a local surfer and two other surfing enthusiasts had to rescue an Australian man from a dangerous rip at Surin Beach. The surfer, who asked not to be named, is no stranger to the rip currents at Surin as he has lived – and surfed – in Phuket for about seven years. Yet, even he rated the rip current at Surin Beach on Tuesday as dangerous. “It was a very strong rip, about 50 metres south of the lifeguard tower. I was sitting on my board and suddenly I was about 50 metres away from where I was,” he told The Phuket News today. At about 5:30pm he saw an Australian man, about 30 years old, struggling while he was caught in the rip. “He was big guy, more than six-feet tall and probably weighed more than 90kg. I pulled him onto my board and it nearly sunk,” the surfer explained. “I looked up and could not see any lifeguards, so I called a bodysurfer and a boogie board rider over to help me and we got him back to shore safely,” he added. “It was a situation that really needed lifeguards and proper rescue equipment and flotation devices,” the surfer noted. The added danger is that tourists are easily tricked by the current weather and surf conditions into thinking that it is safe to enter the water, he added. “The waves were not big, they were small waves, but the rip was very fast,” he said. “Also, it was choppy. I only saw him because I was sitting up on my board. It would have been very unlikely that anyone on the beach would have been able to see him. “I really think that if I weren’t there that this man could have drowned,” he added. “There were red flags all along the beach – I could be wrong, but I could not see a dedicated swim area marked with yellow flags anywhere along the beach,” he noted. The Phuket News has yet to confirm reports that LP Laikhum Co Ltd, which was contracted by the Phuket Provincial Administration Organisation (PPAO, or OrBorJor) only earlier this year to provide lifeguards at Surin, Bang Tao and Mai Khao beaches, is no longer doing so. The Phuket News has received reports that a new company has taken up the role. However, again, grave doubts have been raised about whether or not the new lifeguards have been properly trained for surf rescues or whether they have even been provided the correct life-saving equipment. I've said it numerous times, the lifeguards at Surin are not lifeguards. They are constantly sitting in the shade with their backs to the sea...smoking and napping. They need to be removed and replaced before someone dies.